Linum monogynum is a short-lived perennial or woody subshrub up to 16 in (40 cm) high. The narrow, leathery grey to green leaves are spear-shaped, 0.2–1 in (5–25 mm) long. 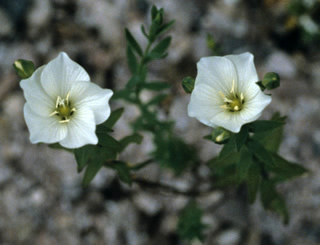 The flowers are white and up to 1 in (2.5 cm) in diameter. Linum monogynum is found in North Island, South Island, Stewart Island and ths Chatham Islands, New Zealand, in sand dunes and rocky places, coastal and also low mountain areas.